So this is an LP made up of the remaining two cuts that were recorded with the quartet made up of myself, Otto Willberg, Colin Webster and Andrew Cheetham in December of 2015 at what was a mega session in 4A Studio, Stockport with Sam Weaver at the helm. The CD that also came out on Raw Tonk Plastic Knuckle also came out these sessions as well as some huge group stuff of Sam’s some duo recordings with Andrew that are also in the archive somewhere. There has been some interest in reviews already which is always really nice. The first from Stewart Smith in his column in The Quietus I want to quote the overall intro at length as I enjoyed it so much! “Raw Tonk, the label run by London saxophone wrangler Colin Webster, is a key node in the UK-Lowlands underground improv axis. Its latest release – their first on vinyl – documents a December 2015 studio session from Webster and his Manchester comrades David Birchall (guitar), Andrew Cheetham (drums), and Otto Willberg (double bass). As with much of Raw Tonk’s output, there’s a punky energy to Plastic Kneecap, but it’s much too weird and agitated to be a blunt exercise in macho blurt. There’s plenty of rasp, fidget and clatter, but it’s brought together with a keen sense of form. Early on, Webster brings the set into focus with sing-song alto phrases in the key of Ornette, encouraging his bandmates to mould their abstract scrabble into some kind of wonky, fragmented groove, as if Prime Time had come up through the post-punk DIY scene. From there, it gradually breaks down into a quieter, more atmospheric section, with tremolo sax tones and growling bass drones slowly surveying a landscape of pattering toms and spiky, creaking guitar. It all builds up to a ragged climax, with Webster’s alto reinforcing this music’s odd relationship with free jazz. “Plastic Kneecap is the thirty-first edition of the British Raw Tonk label, specialized in free improvisation, free jazz and noise, but it is only the first on vinyl. The previous thirty releases were CDs, CDs and a single cassette. Label boss Colin Webster has chosen for this first album a studio recording of the quartet that consists of David Birchall (guitar), Andrew Cheetham (drums) and Otto Willberg (bass). At the end of 2016 the CD of Plastic Knuckle was released from the same foursome on the same label and a year earlier a cassette was released from the quartet on Tombed Visions, entitled Night Streets Of Madness. The new album consists of two pieces that were recorded on December 13, 2015 in The Room at the 4A Studio in Stockport in the English county of Greater Manchester. Anyone familiar with the Raw Tonk label knows that the label stands for raw improvisations. Polishing is not done; it is about the pure reproduction of the moment, of the unadorned version of the music as it sounded on the spot. Of course there is mixed and mastered, but not to smooth things, but to achieve the most honest possible reproduction. The vinyl edition sounds great, almost as if you are in the studio as a listener. The English foursome does not do the introduction or a careful start. All four musicians apply directly at the start of ‘Plastic Kneecap’. Webster plays alto sax and his tone is light. Birchall is the most crude of the musicians here, not playing clean notes, but playing raw and contrarian. The rhythm section is not a rhythm section in the traditional sense of the word, but consists of two free spirits with a sense of musical color shades. Cheetham is often continually busy with rhythmic and a-rhythmic patterns, loose strokes and exciting work on the cymbals. Willberg shows his skills in a short plucked solo, accompanied by Cheetham. The quartet feels each other perfectly. Robust play is replaced in an instant by more subdued sounds and the players also know when to stop for a moment to give room to one or more other musicians. Webster’s sax and Birchall’s guitar are tuned equally hard, which makes the musicians that sing through each other very well. In any case, it is a quartet that has played through each other to a true art. Very nice is the part in which Cheetham uses his mallets and puts a clear rhythm. Webster initially plays long notes over that, but gradually becomes more active. Birchall’s game is very experimental and Willberg plays a few ironed notes. The part turns into a subdued piece that sings from (restrained) tension. With vibrating long sounds of the saxophone, a new part is slowly being worked on. Birchall produces high tones and a drone further on. The drummer uses low toms and the bass sings over it. The intensity increases, until suddenly gas is taken back and side A is quietly and briefly sounded. Willberg opens side B (‘Split Halfway’) with an abrasive bass solo and he is joined by the shivering alto sax of Webster and the Cheetham on small cymbals and snare drums. Birchall plays his inimitable free game and gets plenty of opportunity to display that game because Webster keeps quiet. Style characteristics can not be relinquished on the guitarist, who quickly follows his ideas. Webster chants later with his coarse-grained style, while Willberg plays bass lines. The four musicians find each other again in a wonderfully chaotic part. Because that is where the greatest power of the English lies: the interplay. Every musician seems to be exploring his own possibilities for expression, but in the meantime the gentlemen feel each other perfectly. A duet by Birchall and Willberg follows, in which the high notes of the bassist parry the transverse guitar playing perfectly. Webster is now switched to baritone sax, with which he brings his typical sputtering notes. Cheetham uses his hi-hat and taps on the edges of drums. Webster’s game remains reasonably constant, but gradually he lets his sax vult more. The other three musicians circle around it with their free play. The volume and the activity of all four musicians increase towards the end of the piece, not because consciously a climax is worked on, but simply because the ensemble determines that the music goes in that direction. AND another review this time in Polish via goooogletrans from Andrzej Nowak over at Spontaneous Music Tribune who has become a real supporter and follower of improvised music in the UK as well as in Spain and other parts of the world. “Birchall! Cheetham! Webster! Willberg! Plastic Kneecap! Young Empire Strikes Again! If you’ve read a fairly large, long Tonk on Tribune! Mission Possible! with understanding and due diligence, if the saxophonist Colin Webster is already a recognizable musician for you, it is a sign that the following review does not require any introduction. If during the reading of the text referred to in the first sentence, you’ve come across the Plastic Knuckle album, realized by a quartet of young wolves British improvisation, then you are definitely already at home. The same session – committed on December 13, 2015, in a place called The Room at 4A Studio, in Stockport – which gave three improvisations included on the above disk, today brings another two, this time provided by Raw Tonk Records in the form of black vinyl, under the twin, but not identical title of Plastic Kneecap. The payroll is as follows: David Birchall – guitar, Andrew Cheetham – drums, Colin Webster – alto and baritone saxophone, and Otto Willberg – double bass. Two sides of the disc bring us less than 36 minutes of music. We’re looking inside! Side 1. From the first moment, the narration is sewn with a dense stitch, with dynamic double bass walking, agile percussion, guitar and saxophone flowing in a very free, fast stream. Birchall and his plugged-in chord, which tastes good noise rock, it seems that they make the most of the wind here. Anyway, the whole story is soaked in the old, lover-loving post punk! In the quartet, we note very good communication, because the musicians are perfectly familiar with many improvisations and nothing is a surprise for them in such dramatic circumstances. 5 minutes brings a very jazz exhibition of Willberg, which is supported by Cheetham’s competent drumming. At the same time, the guitar sculpts, while the saxophone is remarkably … silent. The sound of the quartet is dirty, without acoustic fireworks (punk’s not dead!). The musicians play close to each other and rub their elbows against each other. In the 8th minute they give us a bloody, collective escalation. Bravo! Right after it, they are perfectly fast at a slower pace and are stalking autodhorpressive stories. A bit of oneiric guitar chants the meta ballad for bad children. The mantra percussion refers to the narrative path, and the rest of the instruments flows where their imagination will be. In the 13th minute the musicians decided to go down to the level of silence. Kings of slow sonore! The saxophone sends drones, the guitar is a deep ambient, like the fuzzy instrument of Dirk Serries, he also does not avoid flashes. A simply charming improvisation with a hint of remarkable psychedelia, a truly liberated trance! Side 2. Double bass with a stuck, stuck between the strings, burrows the burrow in the ground. The saxophone snorts, the guitar polishes the strings, the plates resonate from wall to wall. Warm up on high C! Agile interactions – today’s question, today’s answer! Musicians catch a dynamic dribble without unnecessary delay. Maybe only a drummer does it with a slight delay. 5 minutes – Birchalla’s exposure to a rock note, and Webster’s viola, vigorous, with a brilliantly dirty sound, in an explicit commentary. Like a punk narrative, with a synoptic sewn into the spinal cord! Intriguing! The immediately escalated escalation that followed has, in terms of genre, completely eradicated formula. It is dynamic, ragged and indeed noisy. Bravo! The stop, after a short time, is attached to the guitar loop and double bass in the stage of trembling walk. The saxophone comes in as a counterpoint! There must be bread from this flour! As if David and Colin mutated the sound of their instruments at the same time. This story has a few threads, instrumentally smells of noise. A section of a delicate acoustic game. What a fantastic dissonance! The saxophone loop puts a stamp of excellence on this recording! Technical glitter on the final straight is also a guitarist’s part! Nice capture of our Sheffield set from March at Bank Street Arts. Each of us labouring under our preferred descriptions. Thanks to Richard Moran for filming. Really excited about a couple of plays on the Sunday of this great looking festival. 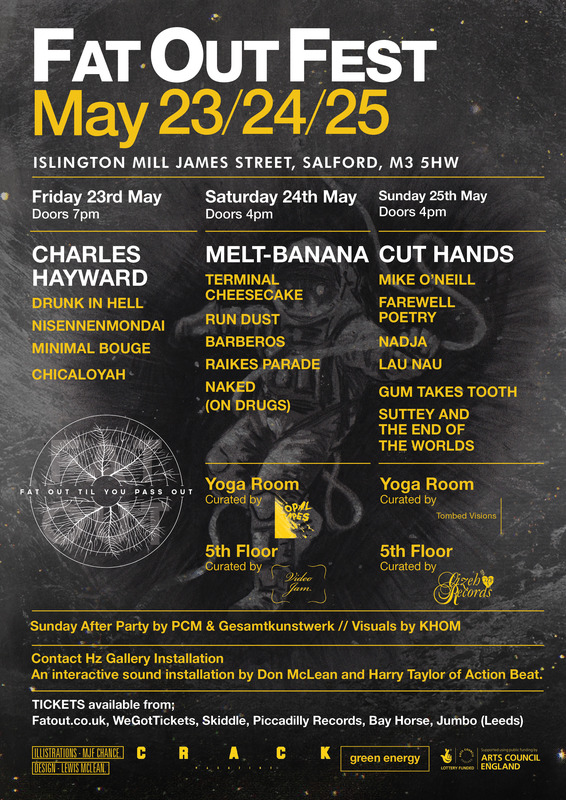 I’ll be jamming for an hour form 8pm with others as part of the Gizeh Records epic continuous 50 human 5 hour session on the floor and then at 11pm I’ll be performing on the Tombed Visions stage in trio with Andrew Cheetham and Colin Webster in a new combination we are really excited about.